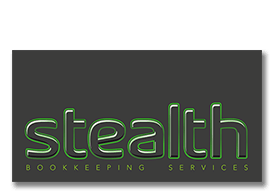 Stealth Bookkeeping Services Limited retain the copyright for the pages of this website and the material and information contained in those pages, with all rights reserved by us. The pages of this site may not, in whole or in part, be reproduced, copied stored, transmitted or used by any party, except for the purpose of downloading for private, non-commercial, viewing purposes or where we have given our prior written consent. You must not alter anything on this website and no material from this site may be used on any other website. No links may be created to this site without our prior written consent. We will not be liable for any claims, penalties, losses, damages, costs or expenses arising from the use of or inability to use, interruption or availability of, this website, its operation or transmission, computer viruses or any unauthorised access to or alteration of the website.